For a system to achive a mechanical equlibrium, a relation must be satisfied between energies such as potential, thermal and kinetic energies. This is called the Virial relation. For example, a harmonic oscillator has a potetial energy of and a kinetic energy . Averaging these two energies over one period, both energies give the same absolute value proportional to the oscillation amplitude squared as and . Another example is a Kepler problem. For simplicity, consider mass running on a circular orbit with a radius from a body with a mass . The gravitational and kinetic energies are equal to and , where we used the centrifugal balance as . As a result, for the harmonic oscillator while for the circular Kepler problem . This ratio is known to be related to the power of the potetial as . Important nature of the self-gravity is understood only with this relation without solving the hydrostatic balance equations. In the following, we describe the Virial relation satisfied with isolated systems such as stars. using equations (2.107) and (2.108). To derive this equation, we have assumed the pressure diminishes at a radius and the surface pressure term does not appear in the final expression. This is valid for an isolated system such as a star. For the gas with , equation (2.119) gives a negative total energy and the system is in a confined state. However, if , the gravity can not confine the gas. This shows us a strange nature of the self-gravitating gas (see Fig. 2.10). That is, if the heat flux flows outward, the total energy decreases . The system must contract and equation (2.119) indicates (the gravitational energy decreases: the absolute value of the gravitational energy increases). However, for the thermal energy, equation (2.120) indicates that for this system to be static. 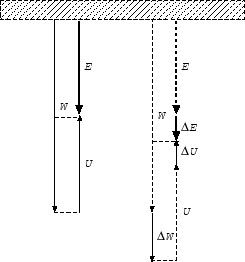 This shows that if the heat flux flows out from the system the thermal energy increases in the self-gravitating system. This comes from the contraction due to the gravity. Figure 2.10: Virial relation for stars composed of gas.